Select background fabrics, cut them to sizes specified in the pattern then piece together. 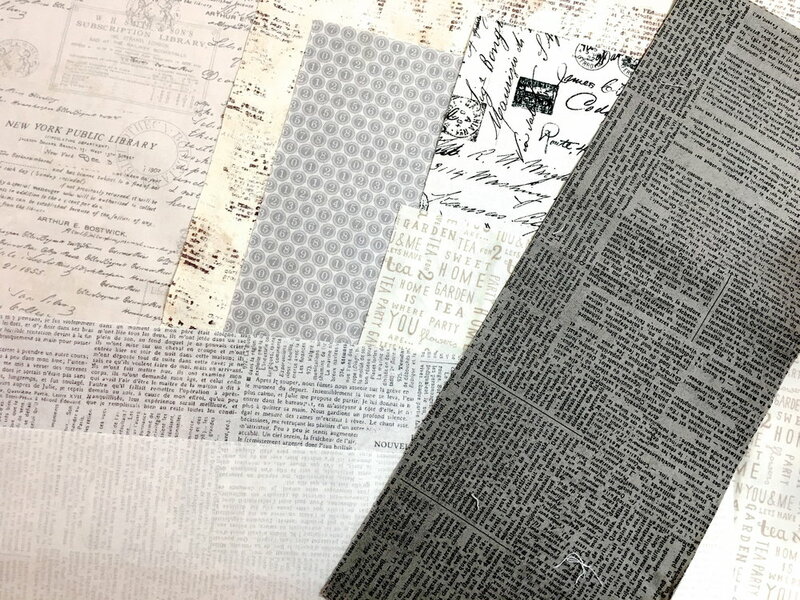 I used Moda fabrics in neutral colors with printed words that included newspaper, typewriter keys, postmarks and maps. Create the focal point of the quilt a Dresden Plate block. 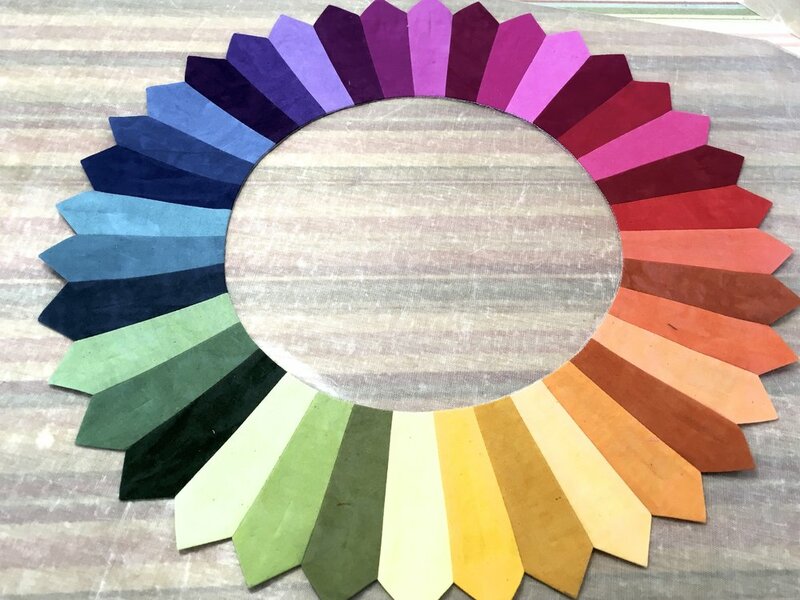 This one was created with 36 colors of Cherrywood Hand-Dyed Fabrics to form a color wheel. They are numbered on the wrong side so they stayed in the correct order while stitching and pressing. Check out the perfectly pointed wedges and the smooth inside circle. Using bias tape makers, bike frame and back wheel are created then fused to the background. Bike parts use Stitch Witchery for perfectly finished edges and fusing to the background. 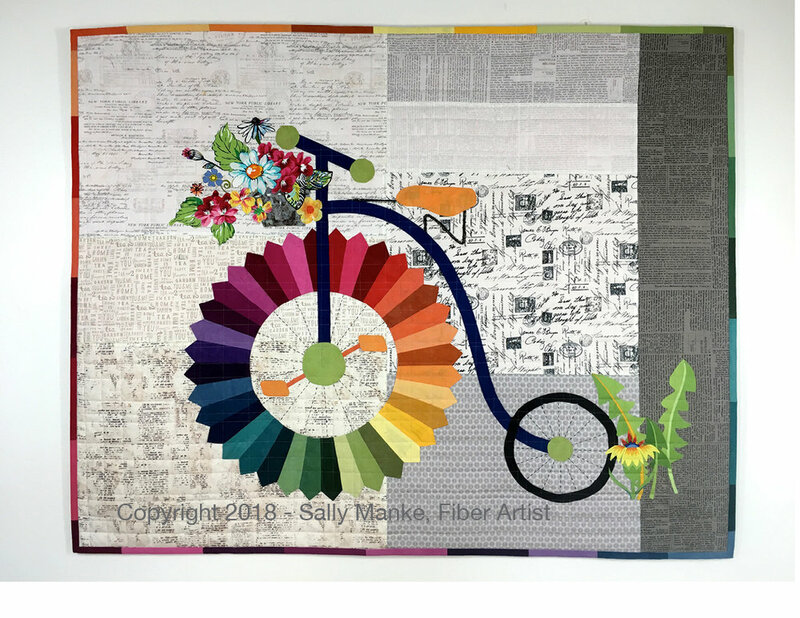 Sashiko stitching for wheel spokes, couched fibers for seat holder and a woven basket on the handlebars are details which add interest and depth to the art quilt. Apologies for not getting a photo of the flower basket while it was under construction. Misty Fuse is pressed to the wrong side of floral fabrics. Fussy cut flowers, greens, birds, butterflies, etc. from fabric. Arrange in basket and press to fuse. With all the details in place, it's off to the long arm for quilting. Modern, straight quilting do the job while not detracting from the busy design. Rows are randomly spaced both horizontally and vertically. Binding is the final step. 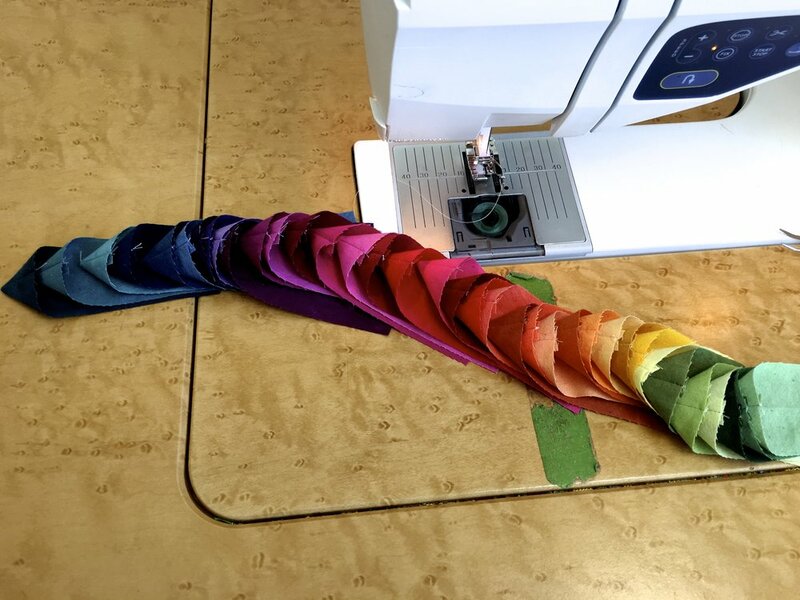 The binding on the outer edge is pieced from scraps of fabric to capture more of the color wheel effect. You can find the pattern in my Etsy Shop. Finished Penny Farthing Art Quilt.